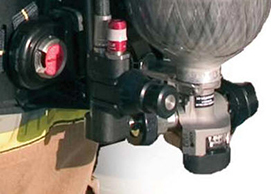 The strategically located Rapid Intervention Universal Air Connection (RIC-UAC) by Scott allows air to be supplied to a downed or trapped firefighter by either a Scott RIT-Pak II or another compressed air source. The Rapid Intervention Universal Air Connection is for emergency use only! Need a price on Reconditioned Scott RIC/UAC (Rapid Intervention Universal Air Connection)'s?